Land-use decisions involve multiple inter-related issues and rarely respect political boundaries. Achieving smart growth requires coordinating land-use decision-making across multiple issue areas and political jurisdictions. To do this, the state must use data and information to inform planning at many levels and implement policies and governance mechanisms that recognize these dynamics. A key aspect of planning effectively for the future, in terms of where and how to spend money on infrastructure and state government services, is being aware of demographic and macroeconomic trends that may affect the amount of growth New Jersey. 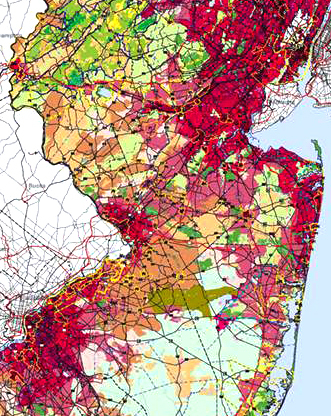 In New Jersey, the power to plan and zone for development is largely in the hands of the state’s 566 municipalities. The Municipal Land Use Law grants towns the power to enact a master plan to set land-use priorities and direction, as well as adopt a zoning ordinance to dictate where and in what form development should take. Recognizing the need for better land-use decisions, and the limitations of effective municipal governance, the New Jersey Legislature has passed an impressive succession of laws to promote regional planning. The State Strategic Plan released in October 2011 is intended to align state agencies and incentives behind a common vision for how New Jersey should develop. New Jersey’s fragmented system of local governance and its disproportionate reliance on property taxes for funding local services (particularly schools) combine to create incentives that have powerful, distorting effects on land-use decision-making.